Thousands of vacancies remain within the VA health care system, having the greatest impact on veterans in rural communities. 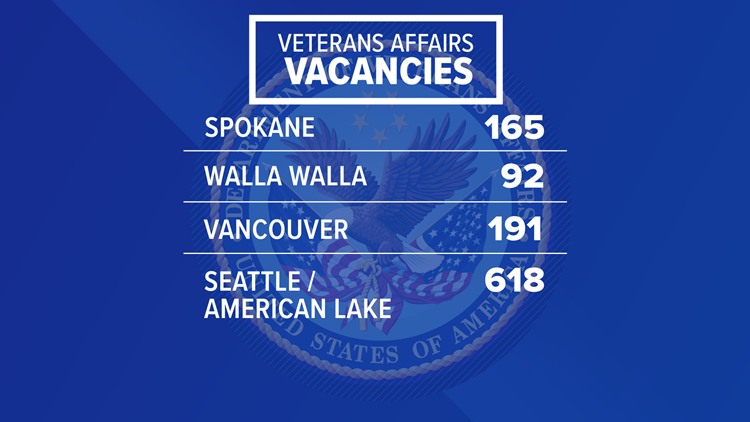 More than 30,000 vacancies remain within the VA health care system nationwide, including around 1,000 across Washington state. While the Veterans Administration says “phenomenal progress” has been made since 2017, a spokeswoman acknowledges rural communities and certain clinical specialties are still posing recruiting challenges. “The ones that really hurt when it comes down to this is the rural communities, and that's where I come from,” said Washington’s American Legion Commander Gary Roach of Chewelah in Eastern Washington. “The services are very, very limited,” Roach continued. Roach, a Navy veteran, has not only received care through the VA health care system, but he’s worked at the Spokane hospital as a service officer. “The people who are there doing their job are doing a great job, and they need to be helped with having staffing that's appropriate because the veteran population is only going to continue to grow as we keep going into different conflicts,” he said. However, as the patient population grows, the VA vacancies in the region persist. While the VA says it has increased hires by 15,000 over the past year, the system is still looking for 33,642 full-time employees. More than 30,000 of the positions are within the Veterans Health Administration. Current FTEE numbers for VISN 20&rsquo;s Washington facilities. “That's nurses, doctors, administrators,” said Washington Congressman Adam Smith, the top Democrat on the House Armed Services Committee. “We've had a major battle at the Seattle VA to get them to fill critical spots,” Smith continued. “That's part of the reason why we have these long lines. Veterans can't get in as quickly as I think they should." Congressman Smith says his office has been tracking this issue for the past couple of years. He believes factors contributing to the delay include bureaucracy and a lengthy approval process originating from headquarters in D.C. The VA Northwest Health Network says the department remains “committed to aggressive recruitment," including offering incentives such as retention and relocation bonuses, tuition reimbursement, and competitive retirement and benefits packages, according to spokeswoman Megan Crowley. Commander Gary Roach believes some of the recruitment challenges stem from pay or lack of research opportunities. The American Legion is currently tracking several pieces of legislation to boost incentives and address the shortages. That includes a House bill called the VA Hiring Enhancement Act aimed at speeding up the hiring of newly recruited doctors. A separate proposal would create a pilot program for pre-med students aimed at introducing future doctors to the challenges and needs of veteran care. Roach says he believes Congress understands the urgency of the situation, as well as the uniqueness of the VA, an organization Roach says blends care, compassion, and camaraderie for those who have served. “There's not too many people running around in our civilian population who have been shot at before. Most of the veterans who are coming out right now have been shot at numerous times. That care is specialized, and we need to stick to that specialized care,” Roach continued.